Solu-Amino 6-0-3 is a rich source of natural plant extracted amino acids, supplemented with a readily available organic nitrogen source. Solu-Amino 6-0-3 also contains our proprietary Solu-Plus technology, bio-surfactants, microbial food sources, vitamins, and enzymes. Many of these components are pre-digested and easy for the plant to metabolize and derive energy from, thus optimizing turf and soil health. Solu-Amino 6-0-3 provides amino acids, along with organic nitrogen, to assist with complete protein production. Whether it is heat stress negatively impacting roots, low light intensity reducing turf density, or colder temperatures limiting organic nitrogen release, Solu-Amino 6-0-3 delivers a complete plant health package for pre-stress conditioning, as well as recovery. 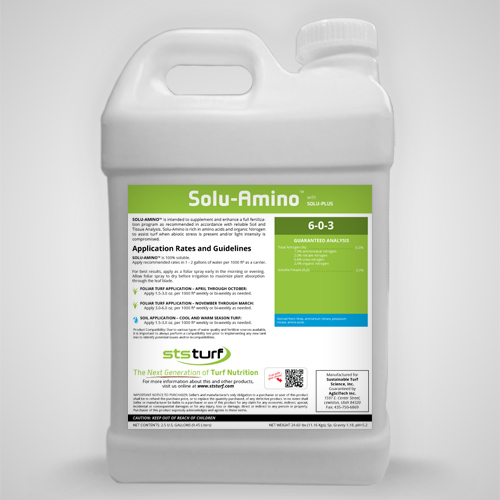 Solu-Amino 6-0-3 will work to improve efficiency of other products It is applied with, from raw source materials to soluble powders, whether they are foliar or soil applied.